I totally forgot about this, but their are WOBs that seem to confirm that this works. And this way has the advantage of not causing the target to spin widely. The downside of course it that it causes the torque to be applied to the allomancer. So they'd need to anchor themself to something solid and burn pewter to handle the strain. If the system is static, then no work is being done, and there's no actual energy transfer. Forces don't intrinsically have energy; they transfer energy when causing a displacement. Fortunately, the two forces applied to the allomancer both target the center of mass, so the net force on any particle of the allomancer is straight upwards, and they feel no torque. At least in theory. On the other hand, we know that allomancers can 'crush' themselves by flaring pushes in opposite directions simultaneously, so the forces aren't perfectly distributed throughout the body. We don't know exactly how the forces are distributed, but given that the two force vectors here have only a small angle between them, I wouldn't expect it to cause severe problems. An experiment worth trying in-universe: Push and pull on the same object at the same time. Whether and where you feel bodily pressure would tell about how the forces are applied. The building on the other hand does experience extreme torque, which is counteracted by the ground if the anchor points are stable enough. Oh absolutely. Someone commented on the image in the gallery that you'd probably need Feruchemical Zinc to switch target points quickly enough. And I'm inclined to agree. Instantaneous thrusts à la Kelsier's battle in the square are much more feasible than hovering. Say the radius of the idol is 10cm. (That's actually a bit too large for 25kg of brass, but eh, round numbers.) The moment of inertia of a solid ball is (2/5)*m*r^2, which works out here to 0.1 kg m^2. The depicted forces apply 600 Nm/rad of torque. So the angular acceleration is 6000 radians per second per second. In other words, ignoring friction, it would take less than a second of constant hover juggling for the surface of the ball to accelerate past the speed of sound. I don't know enough about tensile strength to say exactly when the idol would explode, but yeah. It would heat up, start creating small sonic booms, and then rip in two. (The second scenario avoids these problems by transferring all the force into the ground, which makes the system static.) If you actually wanted to hover juggle something without Lord Ruler level skills, the ideal candidate would be something like a wide, lightweight hoop with a metal ring on the outside. (Cylinders have high moment of inertia for their mass.) It would also help to line the ring with some sort of structure to create plenty of drag and slow the spin. You could probably rig it up to make a musical sort of buzz. Spinning - that's a good trick! Say the radius of the idol is 10cm. (That's actually a bit too large for 25kg of brass, but eh, round numbers.) The moment of inertia of a solid ball is (2/5)*m*r^2, which works out here to 0.1 kg m^2. The depicted forces apply 600 Nm/rad of torque. So the angular acceleration is 6000 radians per second per second. (Or ~57000 RPM per second) In other words, it would take less than a second for the surface of the ball to accelerate past the speed of sound. Hover juggling heavy objects is probably not possible without holding the bands of mourning. This is entirely possible without allomantic friction, but would take extreme finesse. Please refer to the following doodle technical diagram: Suppose you have an mistborn skilled enough to apply forces to parts of objects rather than the entirety of an object. He wants to pick up a brass idol from a pedestal without getting close (scary spiders are at the base of the pedestal). The idol has a mass of 25 kg and its height is 1/6 of the distance between the allomancer and the idol. The bottom of the idol is level with the allomancer's center of mass. For simplicity, assume that gravity on Scadrial creates a downwards acceleration of 10 m/s. In order to overcome gravity, the allomancer needs to exert more than 250 N of upwards force on the ball. Let's double it and say that they want to produce 500 Newtons upward. 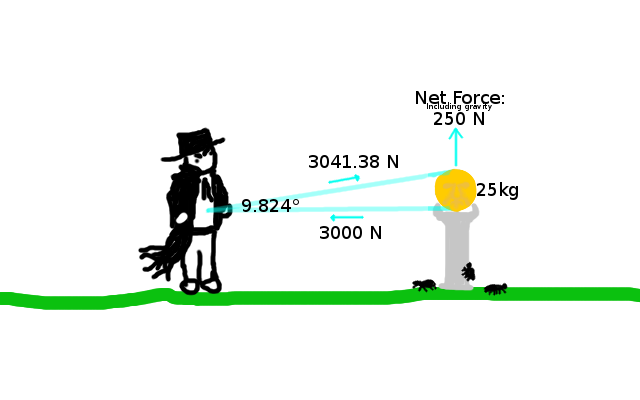 In order to apply that much vertical force by pushing on the top of the ball, the total force of the push must be (500/sin(9.824°) = 3041.38) N. But this push also results in a perpendicular force of 3000 N away from the allomancer. If he pulls on the bottom of the idol to counteract this force, then the net forces will lift the idol straight upwards. (Also, the idol will start spinning like mad, so if the allomancer wants to keep applying the force, he needs to be very good at juggling his target points.) 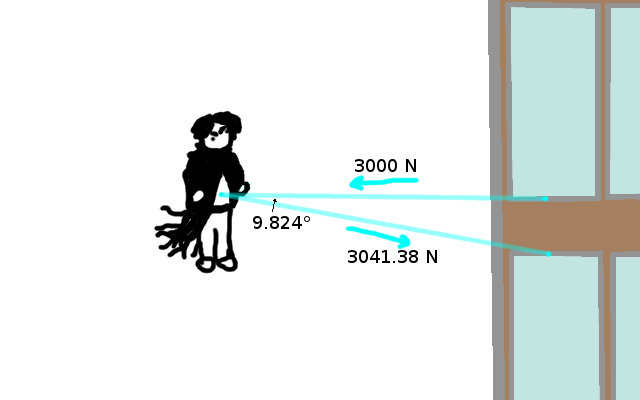 A corollary to this is that a mistborn can theoretically hover in midair using multiple anchors which are neither above nor below her. The closer the anchors are together, the more power and finesse are required to pull this off. Sylvite (Potassium Chloride) External Bodily Pushing "Metal" Burning sylvite allows an Allomancer to push on muscles, forcing them to relax. Sylvite mistings are often called "Salt Masseurs" or simply "Masseurs" after the most common career that such mistings find themselves a part of. At a low burn, sylvite grants the ability to sense nearby muscles. Instead of the blue lines of steel allomancy, this extra sense takes the form of external proprioception. That is, burning sylvite allows one to feel the position of other's muscles as if they were your own. There has been much research comparing the limitations of steelpushes and slyvitepushes. Both are more difficult when directed at a heavily invested target. Steelpushes are limited by intervening material, but sylvitepushes seem completely unimpeded by any material except aluminum. Skeletal muscle is the easiest to push on, and pushing on cardiac tissue is thought to be impossible. Sylvite pushes are also limited by some more ephemeral factor thought to be the Allomancers' connection to or familiarity with the target. Masseurs need physical contact to sense or push on a stranger's muscles. But the muscles of a repeat client can be pushed on from several meters away, and some elderly Masseurs report being able to sense their spouse from across the city. Notably, this connection seems possible to build even when not actively burning sylvite. - Feruchemically, sylvite is used to store bodily waste. Filling a sylvitemind can empty the bladder, cleanse the bowels, or purge the blood of certain toxic compounds. Tapping a sylvite mind is seen as mostly pointless, though some ferrings are known to use a sylvitemind to store and tap blood alcohol content. Sylvite ferrings are sometimes referred to as "Cleansers", but the most common name for such ferrings is much more rude. Potassium External Bodily Pulling Metal Burning Potassium allows an Allomancer to pull on muscles, forcing them to contract. Potassium mistings are derisively called "Potassium Gnats" due to the difficulties of actually using their power. Potassium reacts explosively with water, and so consuming any significant quantity of pure potassium risks injury or death. Safely using potassium allomancy involves consuming extremely small specks of potassium suspended in oil and burning them immediately, reducing the practical applications to simple parlor tricks. - Feruchemically, potassium is used to store bodily excretions. Seperate potassiumminds can be used to store sweat, saliva, milk, tears, and sebum. Potassium ferrings are called "Pureskins". Using potassiumminds is far less dangerous than trying to burn potassium, but still carries some risk. The reactivity of the metal, along with its softness, makes it impractical to carry as jewelry. Thus the metalminds are usually used in the home and kept in watertight boxes. Applications include personal hygiene and as an aid in wet nursing. Hemalurgically, sylvite steals bodily allomantic powers, and potassium steals muscle memory. Thanks to the laws of chemistry, both of these forms of hemalurgy prove difficult to actually use.